Adelaide is one of Australia’s true gems. The city and its surrounds are filled with everything you could possibly want from the Australian experience. With beautiful food, delicious wine, and plenty of Australian nature to explore, both adventure and relaxation await you in Adelaide. Weeks could easily be spent exploring the city, but if you’re on a time budget, you’ll want to see the best that the city and its surrounds have to offer. To help you out, we’ve picked ten of destinations that are nothing more than a day trip out of Brighton Caravan Park. Some may take a few hours of driving to get to, but it’s well worth it for the unique sights. Within the picturesque Cleland Conservation Park, Waterfall Gully has seven spectacular waterfalls to see and experience. After trekking across a walking trail filled with steep hills and clawing through native vegetation, you’ll eventually find yourself at the Mount Lofty Summit with the most incredible view of Adelaide you will ever see. From there, you can refresh yourself at the only restaurant in Australia set at the base of a waterfall. The very height of Adelaide’s beach culture, the most striking thing about Glenelg is its jetty which extends 381 metres out into the ocean. There’s also a wonderful tram ride that takes you down the middle of Glenelg’s main street, Jetty road, where you can enjoy some great shopping. Be sure to visit Haigh’s Chocolate Store for some of the best chocolate in the country, and right on the beach you’ll find a pub with a great lunch menu. South Australia’s wine region, the Barossa offers everything you would expect from a wine valley – plenty of amazing walking and cycling tracks, superb food (and wine! ), excellent golf courses, local art galleries, and quaint towns to visit for a spot of local shopping. The town of Tanunda is the perfect place to base yourself if you wish to explore the region in depth. You could easily spend a couple of days just exploring this beautiful part of South Australia. But if time doesn’t permit, a day trip to a select few wineries is enough to see what the Barossa is all about. Adelaide Hills is a region that plays host to a few small towns and attractions, each with its own character and history. Hahndorf is Australia’s oldest remaining German settlement, while the Beerenberg Farm provides a great opportunity to get your hands dirty and pick yourself some fresh berries. Other people would love to visit and hand feed the animals at Cleland National Park. And for those who like to see the bigger things in life, the Adelaide Hills also plays host to The Big Rocking Horse and Toy Factory in Gumeracha. People who are after sampling local beers, Adelaide Hills plays host to two microbreweries – Lobethal Bierhaus and Grumpy’s Brewhaus. Oh, and for some more great wineries – do yourself a favour and check out Shaw & Smith, they have some really nice drops! On your way through Adelaide Hills, make sure you give yourself plenty of time to visit Cleland Wildlife Park – it’s a full adventure in its own right, especially if you’ve got young ones with you. Hold a koala, or come during the evening to do a night walk and see an entirely different group of animals bustling around. You’re also welcome to join in and feed the lorikeets, Tasmanian devils, dingoes, pelicans, snakes, and reptiles during feeding time. 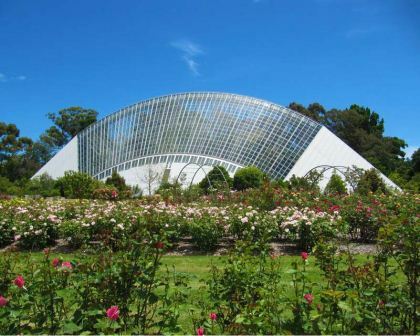 Australia’s second oldest, the Adelaide Zoo houses over 300 species of native and non-native animals. The zoo has an extensive botanic garden as well as its animals, and is separated into various regions – African, Australian, Asian, South American etc. Be sure to visit the giant panda exhibit and check out Adelaide Zoo’s two pandas, Wang Wang and Funi. This is a fair trek, but if you’re keen on seeing Australian flora and fauna, then Kangaroo Island is your best bet by far. With only 4,600 people living on the island, it remains mostly untouched, and you’ll be able to see a full 891 species of native plants (with 46 endemic species). There’s also wallabies, seals, goannas, koalas, and of course, kangaroos. Despite such a tiny population, Kangaroo Island boasts some of finest food in the country, much of it home grown. For some of the most striking landscapes in Australia, you can’t go past Hallett Cove. Not only is it a deeply important historical site with more than 1,700 artefacts collected over a period of 30 years, but you get to see some incredible Pre-Cambrian rocks that sat under a great sea of water 600 million years ago. This provides a spectacular backdrop for either fishing, swimming, or picnicking besides pristine waters. If you’re in the mood for some whale spotting, then the Fleurieu Peninsula is the place to visit. In late winter and early spring the magnificent creatures appear as they make their way back to Antarctica, giving you spectacular photo opportunities in the process. There are plenty of reasons to visit at other times of year too, with kangaroos and penguins jumping around national parks, and a stretch of some of the most stunning beaches in the region. The Fleurieu Peninsula produces amazing dairy, olives, and wine products too… so you can imagine how good the eating is here. Just over an hour away from Brighton Caravan Park, the Fleurieu Peninsula is a great spot for a relaxing day by the sea, or an active day of exploration. The third longest navigable river in the world, after the Amazon and Nile, the Murray River region is one that is ripe for exploration. Grab yourself a water ski, kayak, or bicycle, and explore a region that has been inhabited for over 40,000 years. Travelling the length of the Murray River you’ll experience the oasis experience right on the edge of the Outback, from the citrus groves to the lush riverbanks. Don’t want to explore the river’s surrounds on foot? This is one of the finest places in the state to jump in a hot air balloon and take in the sights from above. Here’s something different that is truly visually striking. Now consisting mostly of salt marsh, a large number of ships were dumped in this area between 1909-1949, deemed to have outlived their usefulness. There are 25 known shipwrecks here, and while there is a lot of modern industry that mars the scenery here slightly, the area around Garden Island is really quite incredible, particularly with mangroves decorating the landscape. Bring along your camera and take some incredibly bizarre photos while here.